There are two kinds of people in this world. Those who love playing pool and play it every chance that they get and those that wish that they could play pool. No matter where you go in the world, you are likely to find a pool table somewhere or the other and with it, a bunch of people who are enjoying it to the fullest. It wouldn’t be an overstatement that pool is perhaps one of the most popular pastimes of western civilization. With that being said however, it is not always possible for most of us to play it as much as we can. Mostly cause of the size of a regular table, the space required to set it up and the cost that buying a regulation size table entails. Thankfully some genius person had this same problem and came up with a portable pool table. A foldable table that you could set up anywhere and any time. Why buy a small pool table? The most obvious reasons why you would think of buying a portable pool table would be to save the space. No more the need to dedicate a whole basement or a whole room simply to the task of playing pool. No more crashing the cue into things around you or even struggling to fit it around you at all. A small table can be setup anywhere without paying too much heed to the space required. Since the table we are reviewing is foldable as well, this becomes even more convenient. Foldable pool tables are indeed a godsend. You can take them along on a trip, open them up on a picnic or when you are hanging out with your beer buddies and feel like a quick game. A small foldable pool table can also act as a kid’s game table. So if you want to get your kids interested in the game then this is the perfect gift for them. A child is much less likely to be enamored by the wonderful sport that is pool when they are thrown on a standard size table from the get set, as it can be overwhelming for them. They will be more inclined to learn the game if they are actually having fun from the outset and this is what a small, fold-up pool table is for. The measurement of the table is 44 by 24 by 29. The 29 inch height means that even taller people can easily play on this table while it is an accessible size for kids as well. 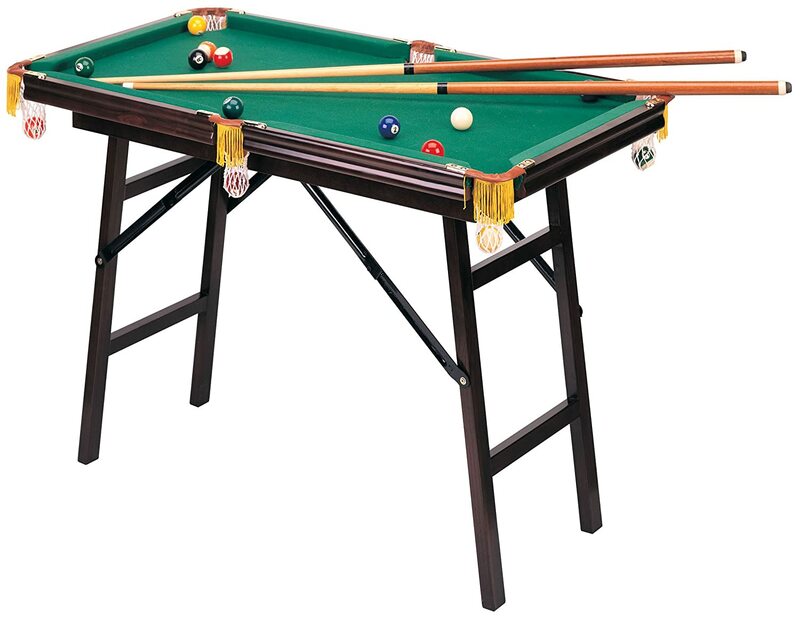 The portable pool table comes with real billiard balls (albeit two thirds smaller than usual size to fit the 3.5-foot table) and comes fully assembled out of the box. No need for you to screw it all together before you can start enjoying it. It is, as they say in the tech world, plug and play. Except in this case it would be, unfold and play. You get the full shebang in the package as well- 2 cues, rack, brush and even chalk. Therefore you do not need to buy anything separately- it all comes in one big package. As mentioned above, the balls are miniaturized and the cue itself comes in two parts that can be screwed on together. The sticks can easily be stored diagonally on the table when you pack it up and are easy to use for a child as well as an adult. The portability of the table however is its best feature. Apart from being easy to carry around, the table is easy to store as well. You can slide it under your bed, or in a closet. The build quality is great and frequent folding and unfolding is unlikely to cause any harm to its longevity. The table is ideal for people who live in apartments and do not have much space for a big table. It can even be setup in your kid’s room. What better way of giving them something to do on a rainy afternoon than a small pool table? The manufacturer has tried to create a real authentic playing experience on a smaller scale and if customer reviews are anything to go by, they have done a great job of it. The CHH mini pool table is sturdy, compact and makes for a great table for all seasons. While a regulation size table experience has its own uniqueness, this portable pool table one is the next best thing after that for sure.